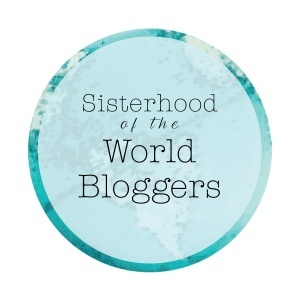 Thank you so much to the lovely Claire at Art and Soul for nominating me for the Sisterhood of the World Bloggers Award. Her blog is a cracker, do visit it. I have taken so ridiculously long to respond that Claire has probably forgotten she nominated me in the first place! I’m sorry Claire, I think I should start an award for the slow and distractible among us. It wouldn’t be very good. When was the last time you wrote something with pen and paper? What was it? I’m a list fanatic so I write daily with pen and paper on anything I can get my hands on…envelopes, post-it notes, packaging boxes. You name it, I’ll make a list on it! Aside from lists, thank you notes and birthday cards, I last wrote something substantial on pen and paper about a month ago. It was a letter to a friend. It was deep, meaningful, supportive stuff (!) that I thought would be nicer to receive as a letter. Of course, being a child of modern times I wrote it first on the computer until I was happy with it then copied it out onto paper! Have you read a book more than once? What was it? Ooo so many. I can’t even begin to recount them. I have a few favourites that I turn to though if I need a bit of familiarity and comfort. One of these is 84 Charing Cross Road. My version includes The Duchess of Bloomsbury Street which, in my opinion, makes the book complete. I think for me it’s all about the writing. My blog isn’t especially creative but this is definitely my creative outlet. I enjoy dreaming up topics (in the shower or the car normally!). I then have a lot of fun over a few days thinking of an angle for that idea/topic. Finally I get to see where the words take it. I like that I’m storing memories in this way as well. What’s the funniest video you’ve ever seen on the internet? If you can remember and find it, please include the link! I very rarely watch videos on the internet. I do recall seeing and laughing at The Green Party’s election campaign video where they parodied the other party leaders. Hmm, but most of my current youtube watching is of Hovercrafts. Lots of Hovercrafts. Oh and the odd crane. Sadly, unless there are any two year olds reading this, I don’t think these are exciting enough to warrant a link here! What were your reasons for becoming a blogger? What is your favourite rainy day outdoor activity? What adventure or experience are you most looking forward to sharing with your child (or children)? So glad you could do this. Don’t worry about the delay. To my shame I have nominations/tags going back weeks I still haven’t responded to. I do mean to get round to it, but life keeps happening. Ahh yes, I missed out all the postman pat and bob the builder youtube videos I have! Life has a habit of happening doesn’t it!? There’d probably be quite a few people in my slow and distractible club. Pop me on the back of an envelope – I am the third member of your slow and distractible club! I have one nomination from June that I haven’t got around to yet (shame). How funny, typing a letter on the PC then writing it up! My handwriting is atrocious so I definitely suit computer work better! Thank you so much for the tag, I have taken part already. If I hadn’t just had a blogging breather (and have lots of catching up to do!) I’d be tempted to take part again – those are some fab questions.